Be the first to share your favorite memory, photo or story of Tonoleta. This memorial page is dedicated for family, friends and future generations to celebrate the life of their loved one. 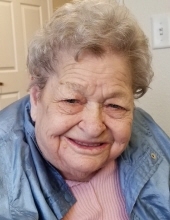 Tonoleta “Connie” Lomax, 93, passed away, Wednesday, March 13, 2019 at Midland Hospice House in Topeka. Tonoleta Nations was born on December 8, 1925 in Brownsville, Texas, the daughter of Andrew Jackson and Allein (Staggs) Nations. She was joined in marriage to Leonard Earl Nech in Texas and he preceded her in death. Later, she was joined in marriage to Virgil Lomax, he also preceded her in death. She was a loving homemaker and mother, all her life. Tonoleta will be forever remembered by three daughters, Fran Swink of Wichita, Allene Griffith of Salem, Oregon and Barbara Grimes of Topeka; two sons, Jim Nech of Houston, Texas and Fred Nech of Osage City; 13 grandchildren, 23 great-great-grandchildren and one great-great-grandchild. She was also preceded in death by a son, Joe Nech; a sister and a brother. Funeral service will be held at 11:00 a.m., Tuesday, March 19, 2019 at the VanArsdale Funeral Chapel in Osage City. Family will receive friends an hour before service. Memorial contributions may be made to Midland Hospice House and sent in care of VanArsdale Funeral Chapel, 107 N. Sixth, Osage City, KS 66523. Condolences may be made at VanArsdalefs.com. To send flowers or a remembrance gift to the family of Tonoleta "Connie" Lomax, please visit our Tribute Store. "Email Address" would like to share the life celebration of Tonoleta "Connie" Lomax. Click on the "link" to go to share a favorite memory or leave a condolence message for the family.